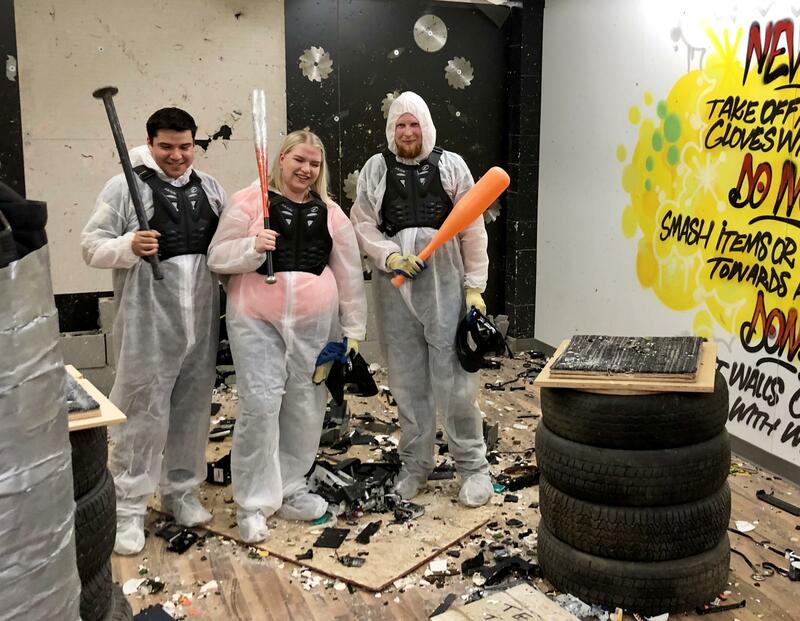 Oscar Gonzalez, Ashley Meyer, and Matt Meyer stand amidst their carnage at Demolition Zone. Demolition Zone co-owner Helen Urban orients a group to the "wreck room" rules and layout. A customer obliterates a wine glass with a direct hit with a baseball bat. Rebecca Kiger and Lawrence Anders of Chicago cool down after a session. Two Demolition Zone customers share a sledgehammer. 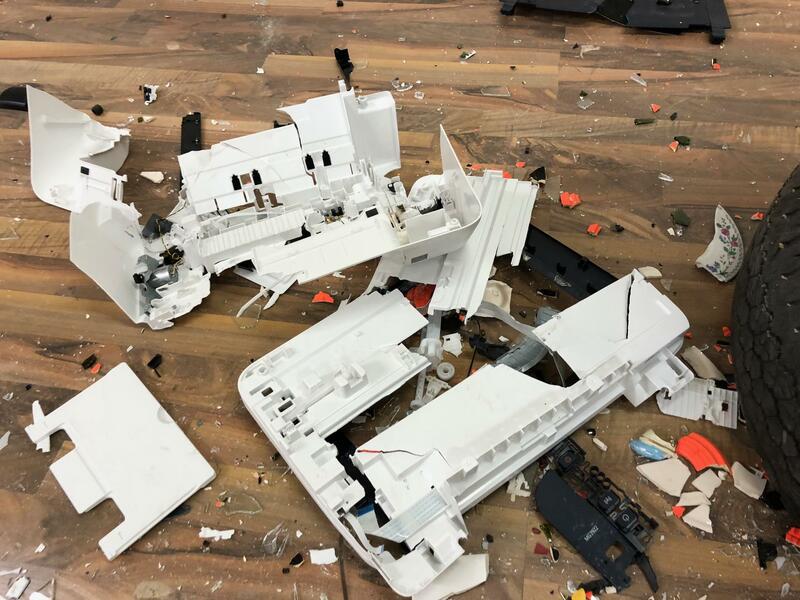 Office equipment seems to be a particularly popular item to smash up. A customer redefines "hitting the bottle" at Demolition Zone. Is your job stressing you out? Or relationship issues? How about those politics? There are many things that can get Oregonians uptight, frustrated, even angry. A Glenwood business says it has just the outlet for those needing to blow-off steam. KLCC’s Brian Bull reports on “Demolition Zone”…which hopes to become a smashing success. 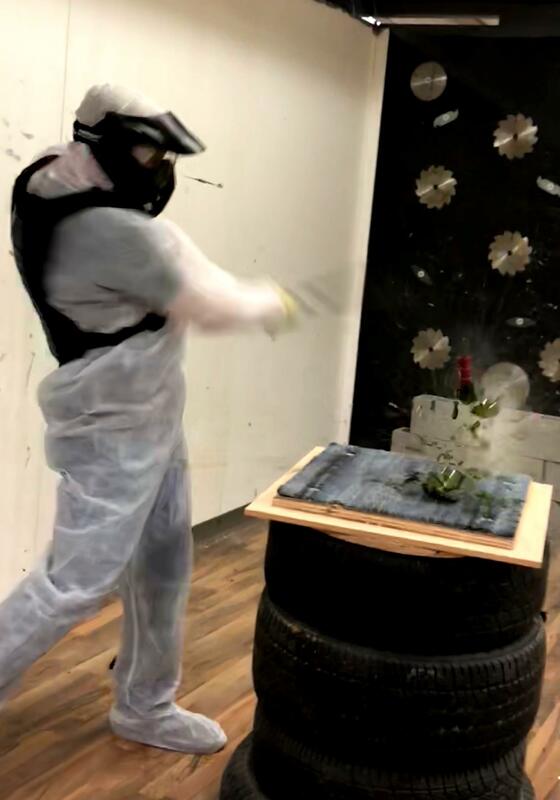 Clad in protective body gear and wielding a metal baseball bat, Lawrence Anders of Chicago prepares to shatter bottles, vases, and toys. Maybe even a TV. “Can I get one of those TVs, does that include one of those TVs?” he asks. "Ah, no, the TVs are extra," answers Helen Urban. 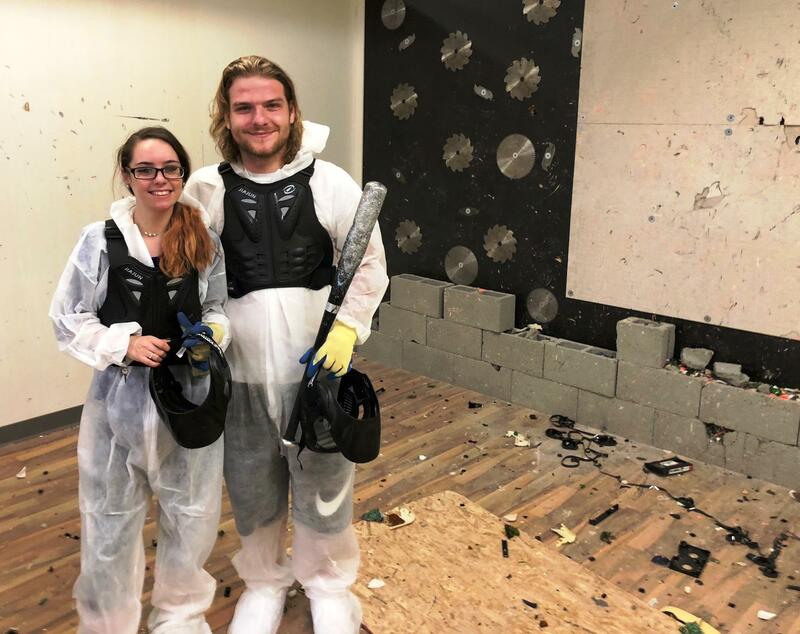 She co-owns Demolition Zone, one of many trending “rage rooms” that have popped up across the country. She explains customer’s reasons for coming in. 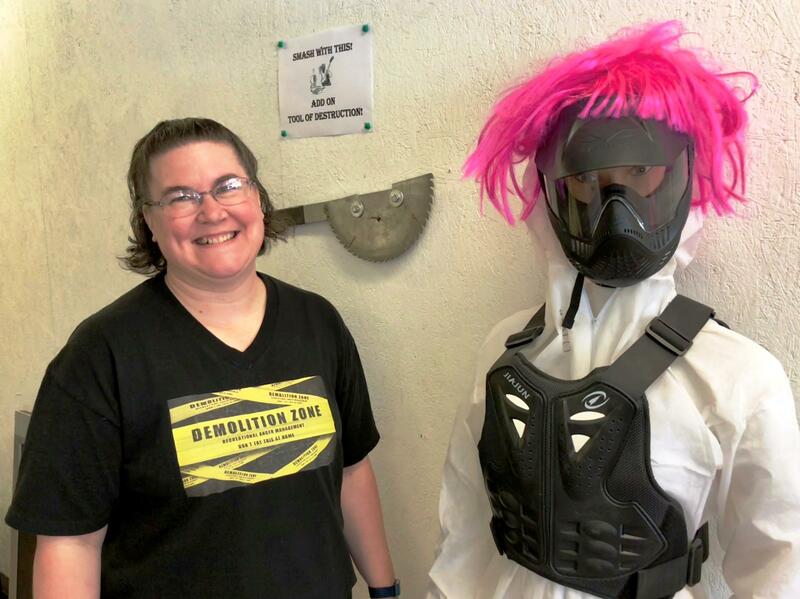 Demolition Zone co-owner Helen Urban (left) with safety-gear model. “Some people just come in just for the fun of it…(SMASH! )...other people just mention y’know, they’ve just had a bad week…(BASH!) They need an outlet for their stress and frustrations (CRUNCH). And that’s absolutely cool, that’s why we’re here (CRASH, CRUNCH, RATTLE). Rebecca Kiger (left) and Lawrence Anders (right) of Chicago. I ask Anders between swings what’s compelled him to decimate a VHS tape labeled “POINT BREAK”, among other things. Bull: Anything in particular you’re raging about? The floor of the main “wreck room” is littered with debris and battered appliances after every customer session. Office equipment is a popular item, especially for those who’ve wrestled with copiers or lost everything when a computer crashed. 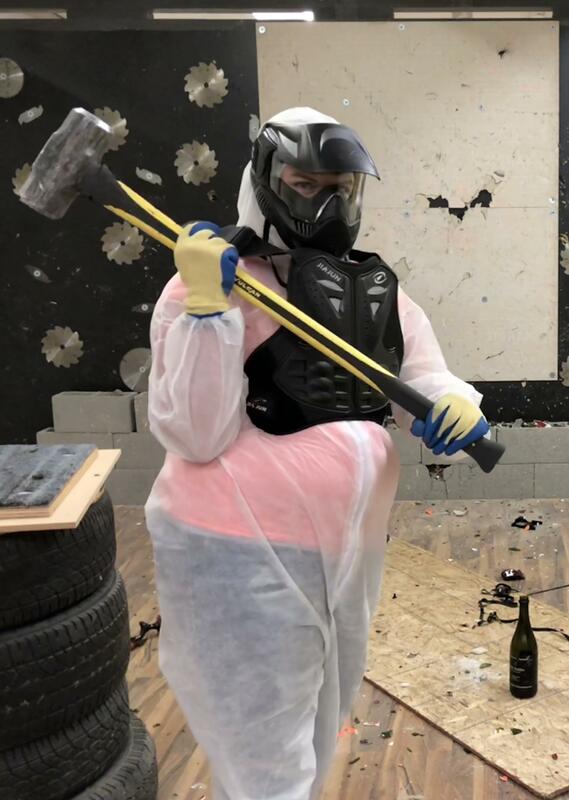 Since opening their business in April, Helen Urban and her husband Jeremy have acquired lots of objects to destroy, and quite the arsenal to destroy them with. 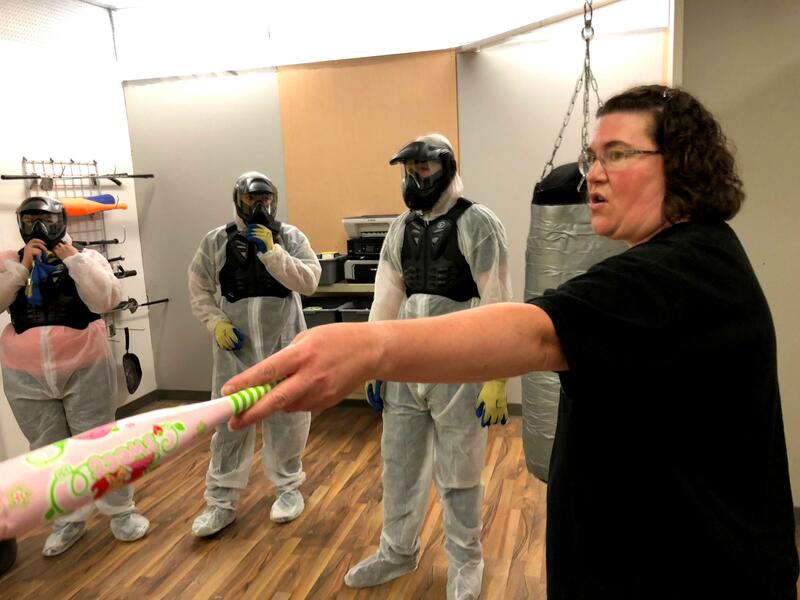 “The favorites here are the metal pipes, we have crowbars, we have baseball bats, and even some frying pans,”she says. Those frying pans are so warped, they look like they fell out of a Salvador Dali painting. 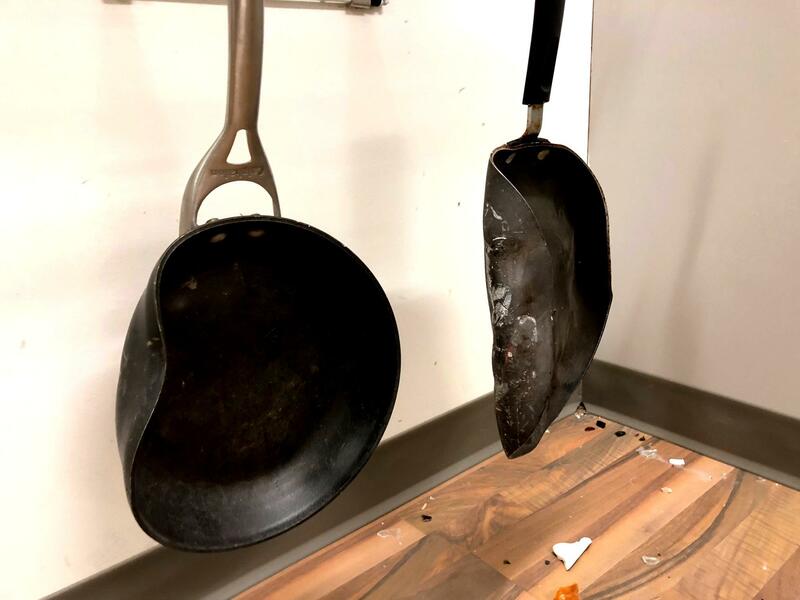 Frying pans are among some of the tools of choice at Demolition Zone, if you haven't guessed. 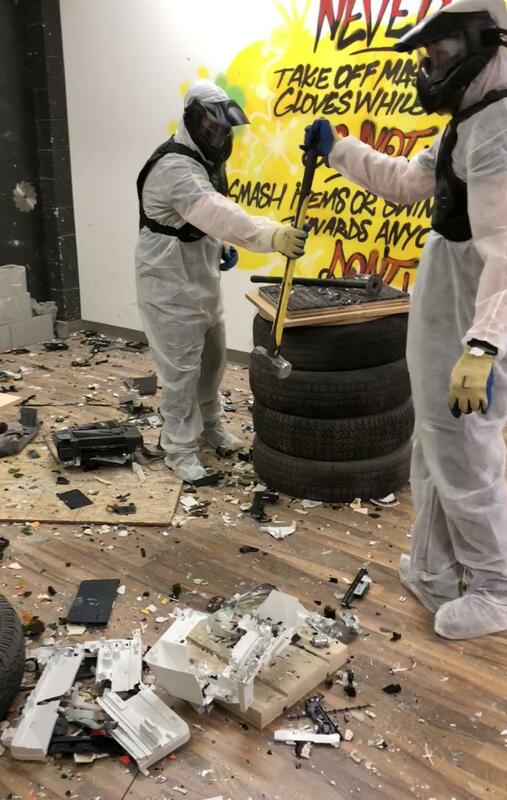 Rage rooms have taken off in recent years. First in Europe, followed by the U.S. While often billed as a form of stress therapy, many in the psychological community suggest these facilities aren’t for everyone. “If you have people with real rage problems, I’d coach them towards a therapist rather than a rage room,” advises Scott Bea. He's a clinical psychologist with the Cleveland Clinic. “They’re beneficial in terms of some fun, and amusement," Bea continues. "There’s probably a discharge of sentiment or emotion, it’s trying something a little novel, or forbidden pleasure. 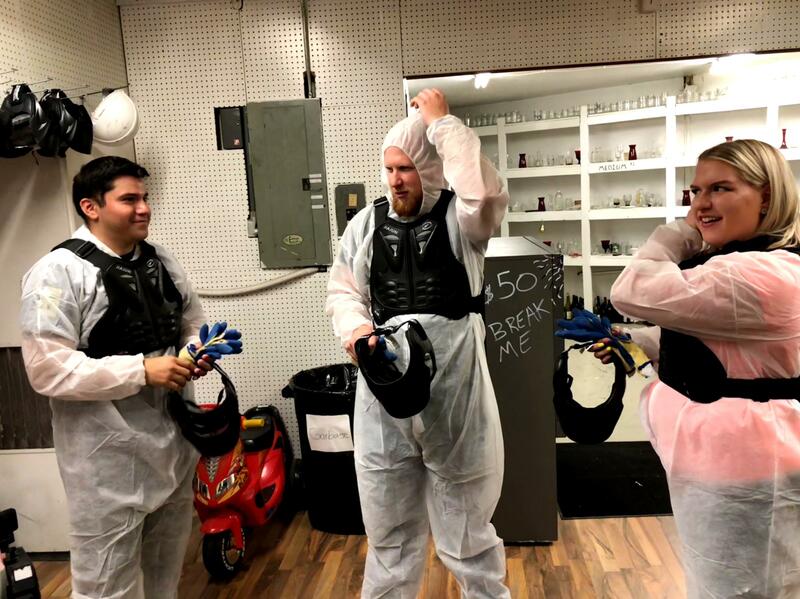 Oscar Gonzalez, Matt Meyer, and Ashley Meyer suit up before entering one of the main "wreck rooms" at Demolition Zone. Busting up things can be a fun time, but many psychologists say if you're truly experiencing severe and prolonged anger, there are a number of therapies including mindfulness and cognitive reasoning that can be more effective. Bea says a number of therapies - or simply humor - are more apt to help. 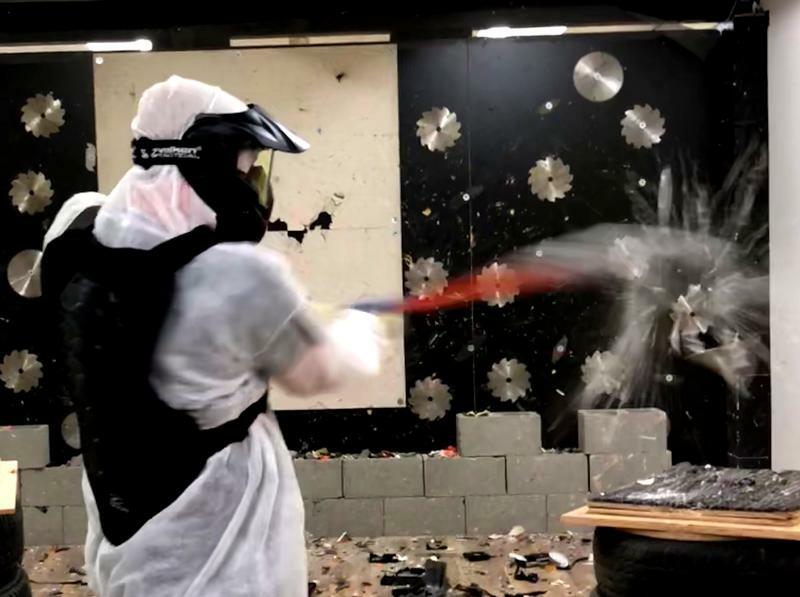 He adds most people who come to rage rooms are rarely in a full bout of anger, anyway. Back at the Demolition Zone, friends Ashley Meyer, Matthew Meyer, and Oscar Gonzalez bash and pummel scores of wine bottles, appliances, and office equipment. Despite the carnage and sweat, their mood is light. Bull: Maybe there was a bad movie that one of your exes forced you to watch? Bull (To Matt): Anything just kinda driving you up the lately? Work, life, love…? 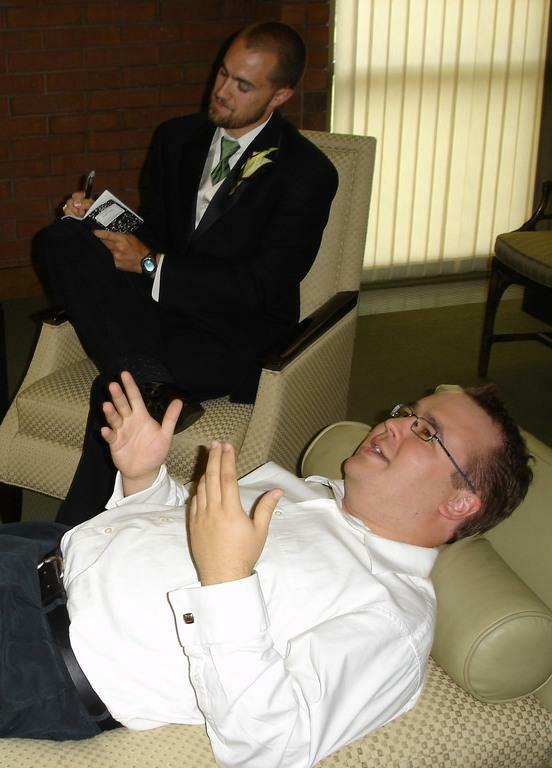 Matt Meyer: Work for sure, it’s been a very stressful time at work. Bull: What’s been the favorite item you destroyed today? Matt Meyer: Probably the printer. Bull: And Oscar, is there anything driving you up the wall these days? 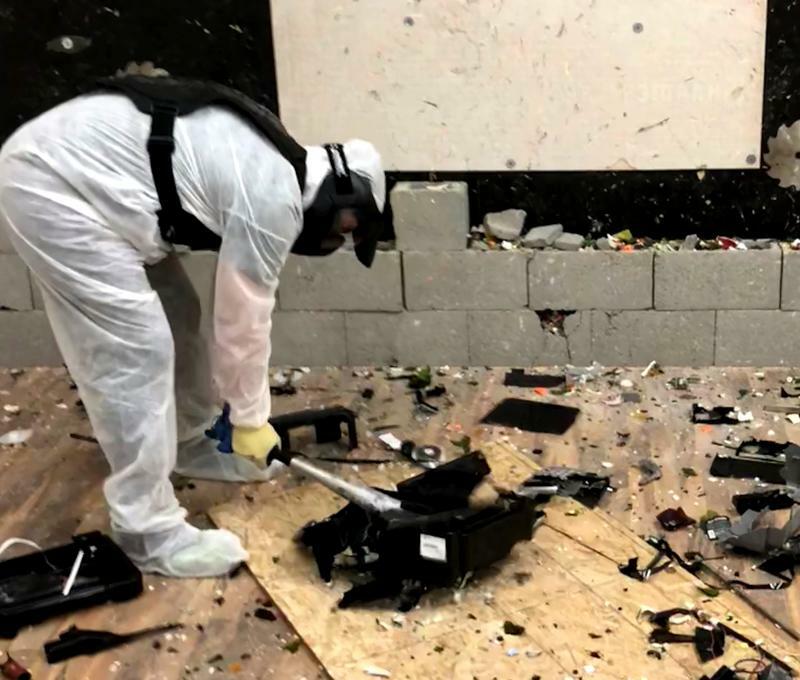 Demolition Zone offers a variety of packages, including one where you can bring in your own items to destroy…maybe that alarm clock that never worked, a wedding video from a failed marriage, or for certain radio reporters, that recorder that chewed up the tape. Which got me wondering…what happens to all that destroyed material? That FAX machine isn't coming back online anytime soon. “The wood and electronics, all that gets recycled," explains Helen Urban. So whether you’re on board with places like Demolition Zone or not, it’s good to know that all that smashing, crashing, and bashing…will be repurposed towards classroom art and recycling. The phrase, “back to school” spurs many families to grab school supplies. Some may reuse stuff from previous years - such as an old backpack or calculator - in order to save some money. School districts cut costs and practice sustainability by reusing materials and equipment gleaned from freshly-demolished schools. 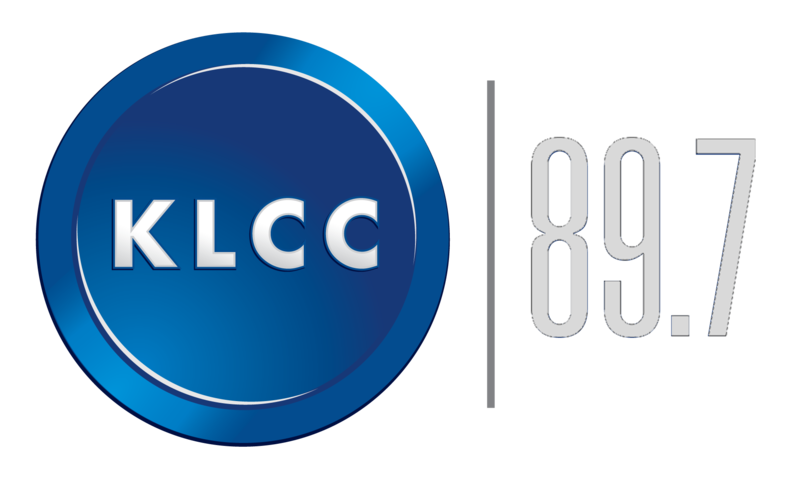 KLCC’s Brian Bull has the story.